LITTLE ROCK, Ark — The Trojans will host in-state rival Central Arkansas on April 16 for a midweek matchup with the Bears, first pitch scheduled for 6 p.m. at Gary Hogan Field. Little Rock is currently 16-19 (9-5 Sun Belt) after a series victory over No. 24 Coastal Carolina and a dominant win over UAPB. The Trojans took two games from the nationally ranked Chanticleers behind big performances from Riley Pittman and starting pitchers Chandler Fidel and Hayden Arnold. Fidel produced another quality start, going seven and 1/3 innings while only allowing four runs in Friday's start on the mound. Little Rock's offense exploded for 14 runs in nightcap as the bats caught fire in game two as well, using a 4-for-5 day from Pittman to pace the offense. Riley Pittman had an incredible week at the plate, going 8-for-10 on the week. In the game against UAPB, Pittman tallied four doubles which tied a school record. The senior scored seven runs, drove in five and added a home run. 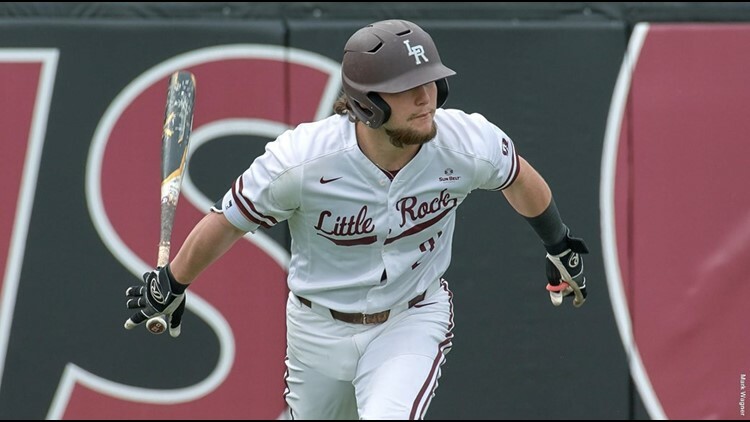 Pittman's four-RBI performance in game two of the doubleheader against Coastal Carolina was crucial in Little Rock's series victory over the Chanticleers. The Bears come into this weekend's series with a 17-19 record (8-7 Southland). Central Arkansas is coming off a series victory over Stephen F. Austin and a midweek win against UAPB. The Bears have posted a .237 team batting average with 14 home runs thus far. They are led by Josh Hagan hitting at a .323 clip with three home runs and 23 RBI. Their pitching staff has been solid, posting a 3.57 team ERA, Cody Davenport leading the way with a 1.64 ERA in his nine starts. After this midweek matchup, the Trojans will head to Monroe, La. to face ULM for a three-game set starting Thursday, April 18. First pitch with the Warhawks is scheduled for 6 p.m. at Warkawk Field.